Before you dispose of anything; contact us first. Tossing items thinking they have no value could be lowering the value of your estate. 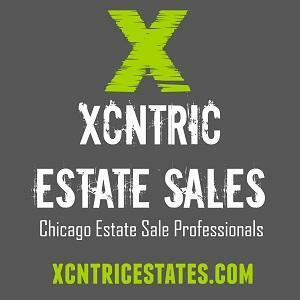 A Premier Estate Sale Industry Leader AND Your Chicago Area Upscale Estate Sale Specialist. Welcome to Xcntric Estate Sales. Your Chicago Area Premier Estate Sale Company. An industry leader and a results-focused estate + moving sales company; we are your Chicago Area trusted name in estate sales. A+ BBB professional estate liquidation specialists that have conducted our estate sale services with successful and profitable estate sales and moving/downsizing sales throughout Chicago, Illinois and it's surrounding south, western and north shore suburbs. As one of Chicago's leading & professional top estate sale companies, we are fully insured and bonded. Our services can assist whether in need of estate liquidation, moving, high-end luxury home downsizing, senior downsizing, merging households, relocating to assisted living, divorce, foreclosure, short sales, or going out of business. We are a full-service Residental and Commercial estate sale provider along with an estate sale online consignment program to fit our client's needs. The decision to liquidate an estate or the contents of a home/household or business can be complicated and overwhelming. We understand the emotional challenge that can occur during these life-changing situations and have helped a multitude of Chicago area families in need of liquidating the contents of their home thru our estate sale and moving sale assistance. Our company's 1st rate estate sale management service begins with personalized care along with a fresh and creative approach by effectively mapping out a strategy that best suits your needs in order to maximize the proceeds of your personal property. Our years of experience provides us with the understanding that no two estate sales are alike; therefore, we focus our attention serving the unique needs of each individual client and tailor our services to meet those needs. Unlike other estate sale companies; we have no upfront fees & provide our clients with 3-day estate sales. As estate sellers, the dedication and commitment we provide is a proficiently managed estate sale that is stress-free and profitable for our clients while creating a fun and exciting shopping experience for our customers. We are proudly and professionally conducting estate sales & moving liquidation sales throughout Chicago Illinois, the surrounding suburbs, Cook County, Dupage County, Kendall County, and Will County, Illinois. SOUTH (SOUTHERN) SUBURBS | COOK COUNTY + WILL COUNTY: Alsip, Beecher, Country Club Hills, Crete, Flossmoor, Frankfort, Goodings Grove, Hickory Hills, Homer Glen, Homewood, Joliet, Lemont, Lockport, Manhattan, Matteson, Midlothian, Mokena, Monee, New Lenox, Oak Forest, Olympia Fields, Orland Hills, Orland Park, Palos Heights, Palos Hills, Palos Park, Peotone, and Tinley Park. WEST (WESTERN) SUBURBS | DUPAGE COUNTY + KANE COUNTY: Barrington, Bloomingdale, Bolingbrook, Brookfield, Burr Ridge, Clarendon Hills, Countryside, Darien, Downers Grove, Elmhurst, Forest Park, Glen Ellyn, Glendale Heights, Hillside, Hinsdale, Indian Head Park, LaGrange, LaGrange Park, Lisle, Lombard, Naperville, North Riverside, Oak Brook, Oakbrook Terrace, St. Charles, Villa Park, West Chicago, Westchester, Western Springs, Westmont, Wheaton, Willow Springs, Willowbrook, Woodridge. NORTH (NORTHERN) SUBURBS | LAKE COUNTY: Des Plaines, Evanston, Glencoe, Glenview, Park Ridge, Northfield, Northbrook, Wilmette, Winnetka. This company has posted a total of 89 estate sales. Only the most recent 50 sales are shown. I want to thank you for all the help you gave me at the estate sale in Prestwick last Saturday. You are enjoying what you are doing and that attitude rubs off on your customers. "Kim and Claire, I want to thank you again for everything you did. You both are wonderful people. I enjoyed working with you. I will highly recommend you to anyone I know who wants to have an estate sale." "Thank you Kim and Claire for an awesome job!! Well done! These ladies are the hardest working women I know. I highly recommend them to anyone and everyone. They are not only professional but personal, they have an amazing gift for focusing their attention on their work AND the client. I felt so comfortable with them from day one! I just can't say enough about these two gals!!" Kim and Claire: "Thank you so much. We greatly appreciate all that you have done to help us and my dad during a difficult and emotional transition. Your professionalism, combined with your good humor, was so appreciated." "Many thanks for giving of your time, your energy, your self. Thank you for the wonderful job you did at my mother-in-laws house!" "Thank you so much for your hard work. You both did a fantastic job and we really appreciate it." "This company did a great job for us! Very happy to recommend to anyone!" "I believe that there is a "HUMAN SIDE" to business. Even though Xcntric Estate Sales had a job to do, it never felt like anything other than friends HELPING me regain traction in life!! Kim & Claire bring an ease to a situation that could have easily been overwhelming; yet it wasn't. I made the right decision when I called their company." "On behalf of my aunts estate our family would like to provide the highest review we can offer Kim and Claire. In a time of sadness and upheaval in our family they were incredibly professional and quite simply the hardest working women I've met in my life. They took the very overwhelming task of not even knowing where to start and handled our loved ones possessions with respect. In addition they got top dollar for our family. Their organization skills are unparalleled. I can't recommend them highly enough. On behalf of our family we thank you for your diligence and expertise."